Two years ago this stand was all dark trunks and loose soil, dusty with soot. The canopy here seems even more diminished, sun rays more harsh on my stubbornly and blindingly untanned appendages. Some things are the same as before, when I trip and catch myself from hurdling downslope on a tree trunk, my hand comes away black, which later I unknowingly smear about my face warding off thirsty mosquitoes. An untrained eye might have seen a ravaged, sterile hill of trees marching into darkened oblivion. The reality is that life is abundant here, with equal or greater diversity to the nearby green forest. Seasons past have sprouted shrubs and a formidable herbaceous layer, keeping my nostrils clear of aerosolized charcoal, but more importantly providing nesting habitat for a bevy of sparrows, warblers, buntings, and flycatchers. Flowers are everywhere, Calliope Hummingbirds flourish. Woodpeckers rattle about in high numbers, more flycatchers and warblers, tanagers, and grosbeaks dine on the smorgasbord of insect delights. Snags have continued to deteriorate providing homes for woodpeckers, in turn coop-ted by bluebirds, American Kestrels, and potentially a few owls. To say the least, the dawn chorus is only rivaled by that of a riparian meadow in the profusion of varied voices. Before Europeans flooded west of the Rocky Mountains, fire, high intensity or otherwise, was the predominant form of disturbance here. Some fires were set by aboriginal peoples to their hunting and gathering advantage, some sparked without human influence. I’d hazard that all should be considered natural. Science would have to work hard to find many climax forests that haven’t felt a few blistering licks of flame at some point in their history. From conifer cones that only bare seeds with heat, to the sporadic and profuse ecological communities taking purchase on a burn, the significance of fire in the natural Western landscape cannot be denied. A bird of particular interest to those who study burns seems to be everywhere this year, clucking and squawking about the char. I felt especially lucky at such frequency two seasons ago. I still did, standing meters from of an apparently oblivious woodpecker, chiseling murderously and pointedly into a particular charred, decayed mast. They’ve expanded to take temporary advantage of the trees that are in a slow downward spiral. Debilitating beetles are amassing to bore their wayward paths through the tree’s living layers. These beetles play their role in the stable ecosystem here, not only as a woodpecker food source, but in maintaining the fitness of unhealthy forests, making way for a new one through years of natural succession. Black-backed Woodpeckers (Picoides arcticus) are not a common species. Here in California we are in the Southern nexus of their Black-backed range, which extends from central Alaska, throughout most of Canada and portions of the Northern and Western US. They fill a niche that many others of their ilk have only generically flocked too; they have embraced burns as primary habitat. 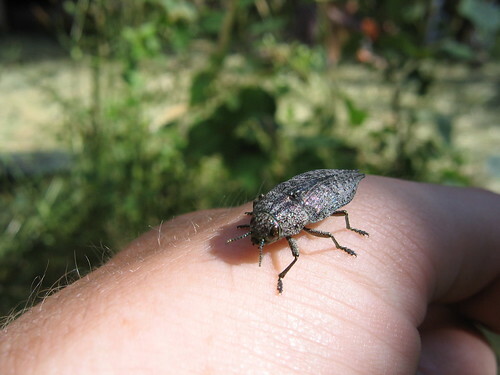 Their main source of food are the grubs of wood-boring and bark beetles of the families Buprestidae, Cerambycidae, and Scolytidae, which means they do also occasionally show up in areas where disease has struck such as dutch elm or in particularly nasty windthrows. The birds and beetles are both after large scale disturbances in forests, the beetles to lay their eggs there and the birds to eat the larvae. In Washington, Oregon, and Idaho Black-backed Woodpeckers are designated as sensitive species. This is because burned forest of the right qualities isn’t common either. With fire suppression and post fire salvage logging what it is, priority is often in wood production and protection not woodpeckers population. 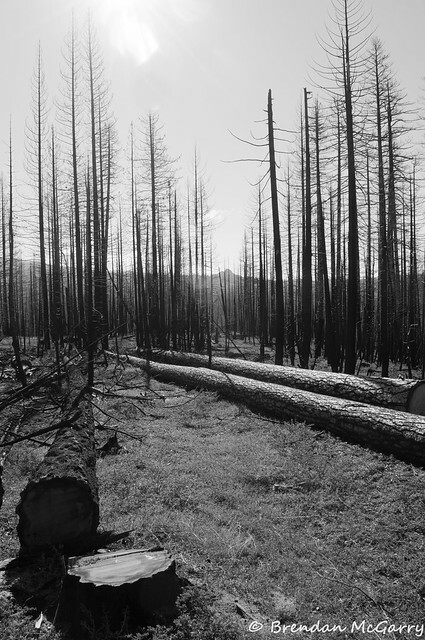 To provide an example before such practices, in the Rockies half the forest burned every 100 years and 35% of the forest was less than 40 years old at any one point. Fires resulting in stand replacement, ones with enough intensity to kill all the trees in a given area, happened 1.5 times more frequently. Forest that is left to regenerate naturally, when salvageable wood exists, is less and less common. Just having a fire in a forest isn’t the key to the importance to the many species that are using burns. For woodpeckers it’s about the intensity, which in turn dictates the number and size of the dead or dying trees, in turn affecting the infestations of their favored food items. 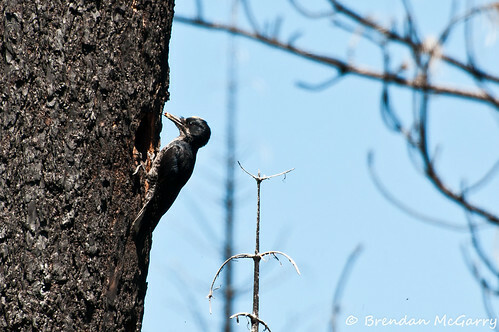 All woodpeckers that are common here in the Northern Sierras use burns to some extent. Even Pileatated Woodpeckers, whose size dictates older secondary or primary stands, will use adjacent burns for the excessively rotten cavities and roosts they prefer. 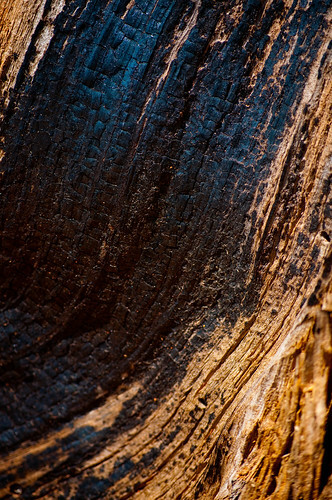 Burned forest offers a good source of food and softer, decayed wood for cavity excavation. Both Williamson’s and Red-breasted Sapsuckers need partially living trees for their sap wells, so they are slightly less prolific dwelling on the edges. Yet the burned forests aren’t a homogeneous spread of charred trunks and dead canopy, they are a complex mosaic. Except in extreme cases, fire doesn’t sweep through a forest leaving uniformity behind. I don’t really know if she had a nest or not. Sidling about the top of a half dead Jeffery Pine, she was scolding a Northern Pygmy Owl that already had its fair share of excited attendants. Her odd reptilian shrieks were spouted as she bobed her head pedantically, left and then right again. Woodpeckers often seem very tense to me. Wasting twenty minutes with the other disapproving rabblerousers, even on a threat like an owl, wasn’t what I’d expect from a responsible mother. Especially one that should either have eggs to incubate or nestlings waiting for a meal. Another twenty were spent spanning a series of trees, squeaking each time she jumped to a new trunk, and chasing a male Hairy Woodpecker who dared enter her glade. At the edge of a shrub field and the edge of my transect, she disappeared downhill, presumably to shriek and eat more bark beetles. I don’t believe she had a nest. Maybe the pygmy owl ate her male. Dusty, charcoal is the defining plumage characteristic of the Black-backed. Again, in the burns they likely evolved alongside, this helps them blend in. Other species are easy enough to find in living habitat and to be clear, you find Black-backs in live forest as well, high numbers are almost exclusively in forest that’s been burned or disturbed. If it wasn’t for their frequent vocalizations and their relative calm tolerance of people, I doubt many people would see them because of how splendidly they blend into the bark of a burnt tree. A female is mostly charcoal black with only slightly contrasting ventrally with a dingy gray (white when clean). The white moustacial stripe, black and white barred sides, white spotting on wings, and often concealed white outer tail feathers are easily missed, they look generally black, white, and gray. The male mirrors this, yet has a golden forecrown that is often tinged with the sooty product his lifestyle. Another thing that distinguishes them from most of their congeners in the genus Picoides is that they have three toes instead of the usual four zygodactyl, (think of an X with each point being a toe). The only other woodpeckers in the genus that share this trait are Three-toed Woodpeckers (of Eurasia and North America). You can hear them throbbing, boring, scraping, pupating, the antithesis of a heartbeat. Pulsating pestilence. The wood-boring beetles, the bark beetles, taking advantage of the weakness a burn creates, they are still a part of the system. Those wormlike tracings of inner wood one finds from time to time, on a barkless snag or on beached driftwood are the tracks of these beetle grubs. Investigate a fresh forage mark on a tree; bark is chipped away in an oval, exposing gleaming cambium, with a smaller beak sized hole in the center. A tunnel extending from any which way, will probably terminate at this excavation. The beetle, eating its way through a dead or dying tree, met an end at the awl of a Black-backed Woodpecker or maybe a cousin Hairy Woodpecker. Whether they can avoid their demise I don’t know, but with obvious strength with which a woodpecker hammers in investigation, there is little likelihood a beetle grub can do much beyond bare wood-boring jaws. Bark beetles may seem ominous, even malicious, the gruesome death rattle of a tree going out, but nature doesn’t trade in villainy and heroism. Woodpeckers also help degrade the forest, burned or otherwise. Foraging is destructive, but also potentially spreads fungi. Like big pollinators, woodpeckers may act as vectors of wood degrading fungus. Imagine them spreading fungus unknowingly when visiting one tree with a fungal colony and then another without; they’d unwittingly get quicker access to wood best for cavities. Those wounds in the trees allow spores easy access to still live trees. This is a stunning example of a mutually beneficial behavior, surprisingly simple, and while it is elegantly plausible, it needs more research. Their nests aren’t very easy to find just by looking. Searching for cavities is always most effective by watching behavior, but you can find cavities by looking for the right snags. You’d have to be supremely lucky to find one just marching through the forest, particularly a Black-backed who I’ve only found in dense stands of trees. Unlike their relatives the Hairy Woodpeckers or White-headed Woodpeckers, who usually like broken topped, well decayed snags with various species preferences, a Black-backed seems less picky, a half dead or fully dead tree with a lot of bark and branches is suitable. Even though they aren’t necessarily loud, they are talkative enough and easy to track down. In a further three or four years however, Black-backed Woodpeckers will likely have moved on from the burns I traverse in favor of more recent ones, both for food and housing. A sensitive, enigmatic species, Black-backed Woodpeckers are the focus of many studies focusing on many aspects of a healthy forest and how we live with fire in this landscape. 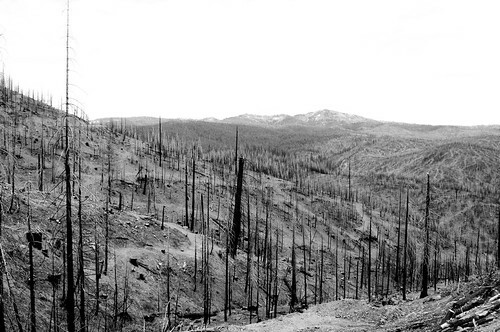 It is all too easy to look at a burnt forest as a wound, a loss of resources, but the exact opposite may be true. There is likely room for all the things we need from forests as well as what the birds need to maintenance their populations. Comprehension of all the swirling aspects that come into play is highly complicated, fire alone is enough to fill a lifetime of work. Yet understanding how a woodpecker uses a burned forest can provide measures to help forest managers keep our best renewable resource vibrant and productive as well as protect important species. I like to preach connectedness but I can’t squeeze all those ideas into a few paragraphs so I’ll leave with this: I simply enjoy noisy, odd Black-backed Woodpeckers. 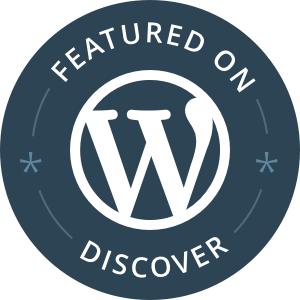 Their lives as irruptive, opportunistic species, makes for exciting variety to a casual observer and evocative study species to a researcher. They are enigmatic and specialized, the fact that they are so uncommon makes them all the more enticing. Next time you see a large burned forest, maybe devastation won’t be the only thought cross your mind, maybe a Black-backed Woodpecker will sputter through squawking. 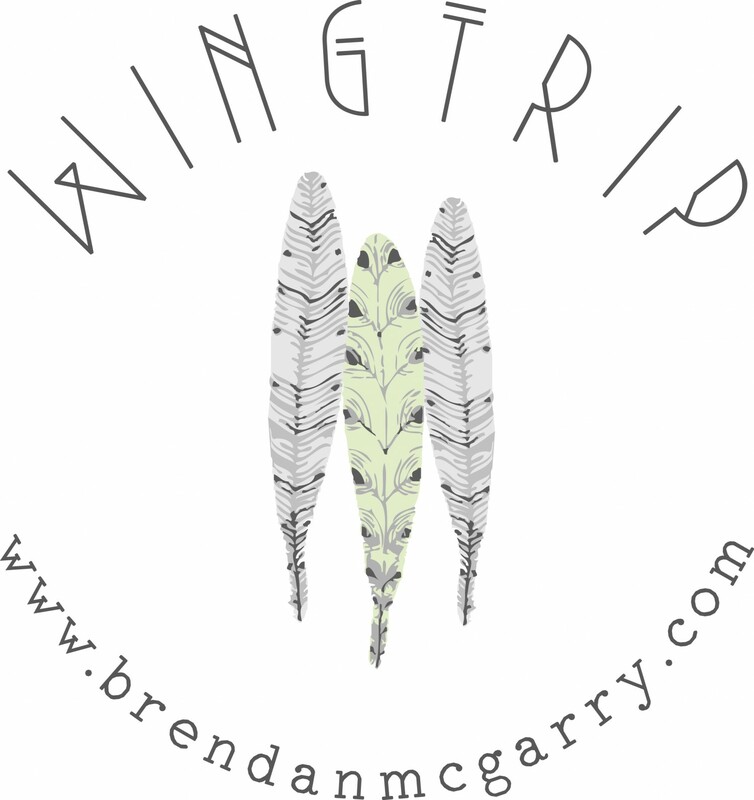 Thank you Brendan. I’ll never look at a burn in quite the same way again.